It’s just another day of classwork for Auburn University students Keith Henderson and Chris Kemp – except that today, this class isn’t held inside of a building. These graduate students, whom are both working on their master’s degrees in Fisheries Management, are down in Lowndes County at Wheeler Farms assisting David Harrell with his Alabama property management services. The Southern Land Brokers has a great relationship with Auburn University. The service these students are providing today can easily cost landowners anywhere between $700 – $900. However, because we work directly with Auburn University to provide these locations for students, this service is provided free of charge to our landowners. This agreement works out great for the students, as well as for the landowners who desire healthy and stable populations of fish on their properties. Graduate students, like Keith and Chris, travel to our properties to perform the research needed for their theses. Today, Keith and Chris have brought specialized equipment with them in order to sample and collect data on the fish that live in these waters. Attached to the front of their boat is a device called an “Electrofisher.” This device is used to send an electrical current through the water to stun the fish around the boat. Once the fish have been stunned, they are collected for data analysis. After the data has been collected, they are then safely returned to the water. This process does not harm the fish and provides an efficient way to study the ecosystem of the lake. Perhaps the best part of this experience is getting to see just how large the fish can be. The big fish that are usually elusive to fishermen can be easily found using this process, and excitement builds as each round of fish are brought up for study. Just a few of the things that Keith and Chris are observing and recording are the oxygen levels in the water, fertilization statistics, feeding patterns, fish size, weight and age, and the overall health of the lake. One of the most common problems that we see with lakes is that landowners are simply not fishing appropriately. Fishing too little, or taking too many of a single type of fish has a negative impact on the ecosystem. 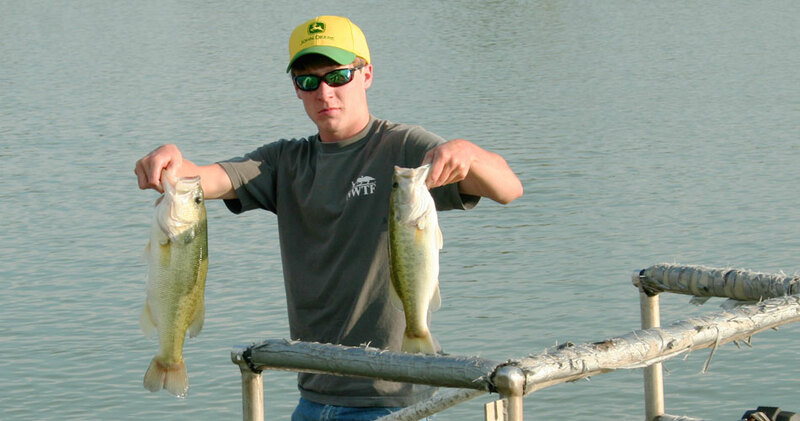 For instance, if too many bass are caught, the system becomes overly crowded with brim. 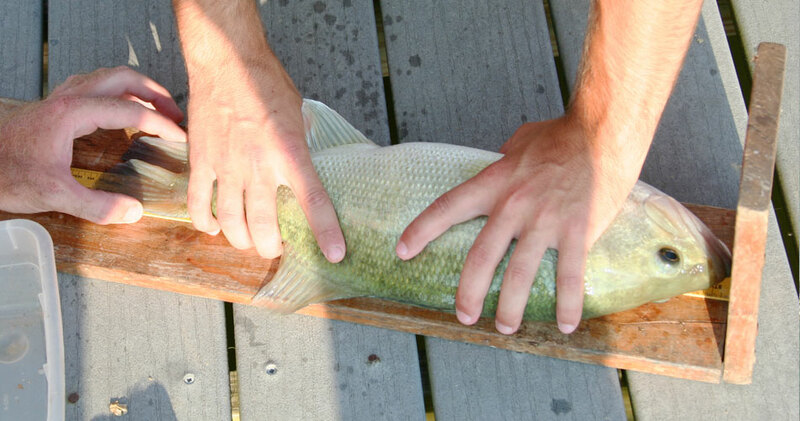 If too many brim are caught, the bass become smaller in size and weight. Students like Keith and Chris perform this analysis on the lake so that we can create a plan to stabilize the fish population. At Wheeler Farms, this particular lake had a few too many bass, mainly due to the landowner not fishing the water enough. 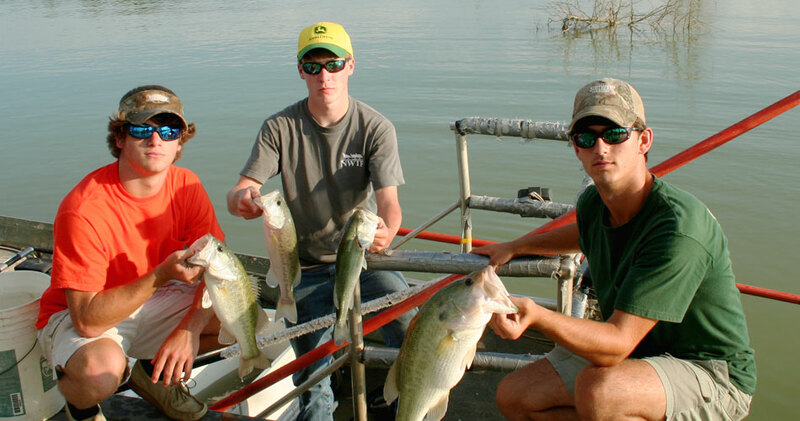 Over the course of the next year, we have recommended to the landowner that he take more bass out in order to balance the fish population again.